While the tonsils may occasionally become swollen when you have an infection, for most people the swelling goes down in a few weeks. For some people, however, the swelling becomes a chronic condition and can lead to other health complications if not treated. In some individuals, the swelling in their tonsils becomes a chronic condition that does not go away. Others may have recurrent tonsillitis, a condition in which they have frequent infections that cause their tonsils to become swollen on a regular basis. The large size of the tonsils can lead to other health risks and complications. While swollen tonsils alone can cause complications, each different infection will also have other complications that are not related to the tonsils. For example, untreated strep throat can lead to kidney and heart problems. This article will cover complications specifically related to the size of the tonsils due to swelling. Other than infections, swollen tonsils can also be caused by tonsil stones (cryptic tonsils) or, more rarely, cancer of the tonsils. Your biggest complaint while having swollen tonsils is likely to be a sore throat. This may cause you to have a lack of desire to eat or drink due to the level of pain with swallowing (also referred to as odynophagia). While painful, it is very important that you keep drinking to avoid dehydration. Eating is also important to maintain your health and avoid malnutrition. With acute swelling of the tonsils, lack of eating is not likely to result in malnutrition, however, if you have chronic or recurrent swelling and pain, lack of adequate nutrition and weight loss can become an issue. Whether chronic or acute pain with a sore throat, you should always drink plenty of fluids to avoid getting dehydration. Sleep apnea occurs in approximately 1 percent to 4 percent of children and the recommended treatment is surgical removal of the tonsils and adenoids. While swollen tonsils can cause sleep apnea in adults, it is less common and more often related to other factors, such as obesity. Sleep apnea caused by enlarged tonsils often leads to the surgical removal of the tonsils. Difficulty breathing—it is possible for the tonsils to become so swollen that they block off the back of the throat and the airway. Peritonsillar abscess—occurs when infection from the tonsils spreads deep into the tissues of the head and neck. Most commonly occurs in adults and is rare in children. For acute tonsillitis, you can treat the symptoms. For pain associated with swallowing, you can use lozenges with menthol or throat sprays (like Chloraseptic) and over-the-counter medications like Tylenol or ibuprofen. Treating pain will help you to be able to eat and drink. The other symptoms will improve with treatment (antibiotics) if the cause is bacterial or time if the cause is viral. Chronic tonsillitis or recurrent tonsillitis is different than the occasional infections which cause a temporary episode of swollen tonsils. These conditions usually persist despite the use of antibiotics or adequate time and rest for your immune system to fight off an infection. While some physicians may choose to try experimental medications such as steroids to shrink the tonsils, these medications may fail or have side effects that outweigh the benefits of their use. Even if these medications work initially, symptoms may recur. 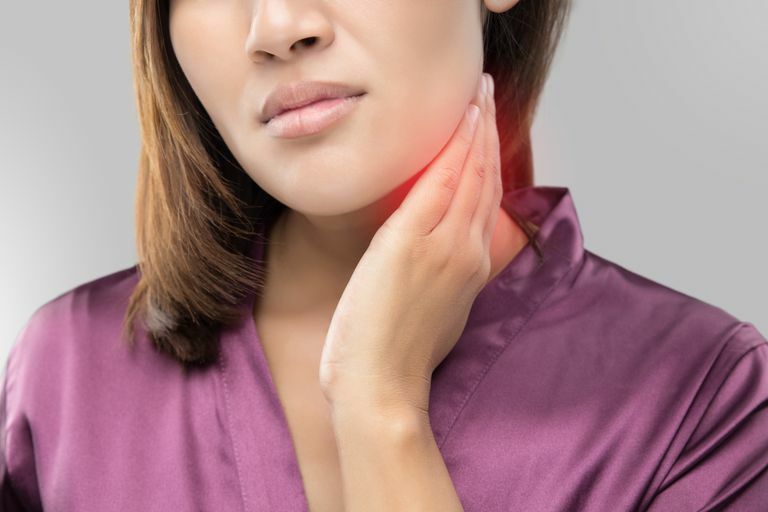 When other treatments have failed to decrease the size of your tonsils your doctor may recommend surgical removal of your tonsils and adenoids, especially if you have complications such as sleep apnea. Sleep Apnea Information for Clinicians. American Sleep Apnea Association. https://www.sleepapnea.org/learn/sleep-apnea-information-clinicians/. Tonsillitis. American Academy of Otolaryngology-Head and Neck Surgery. http://www.entnet.org/?q=node/1447.